I’ve been working on A Dan language for nearly three years now, though I haven’t finished it yet. I have a basic idea of how it sounds like, with now complete phonetics, and general rules for things I’m using in my novels and stories, like nouns, place and personal names. Though I speak several languages (programming languages included), linguistics is way outside of the spectrum of my expertise. Being an engineer, this is what I’m trying to do here: to engineer a language. It is a major work in progress, and I still have to understand a lot about linguistics. 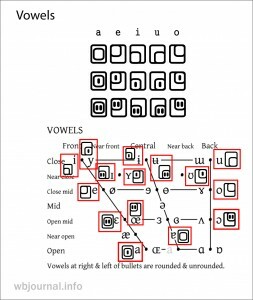 Type of writing system: alphabet. 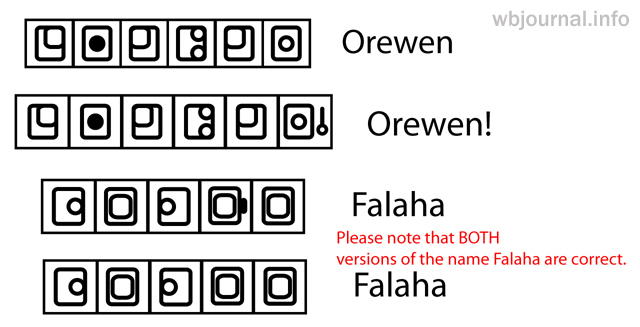 In A Dan glyphs are written in squares called boxes. Text can be written horizontally from left to right, right to left, and vertically from top to bottom. Handwritten text usually has right to left alignment, because most of the Danna are left-handed. 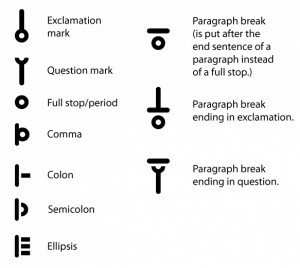 Word glyphs are clustered together and glyph clusters (words; also called populations) have spacing between them. 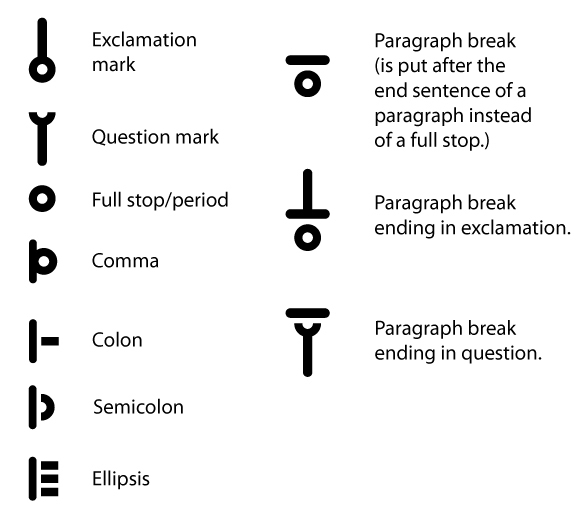 Punctuation signs are included into the last box of the word, after which they follow. 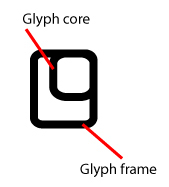 A Glyph consists of a frame and a core. 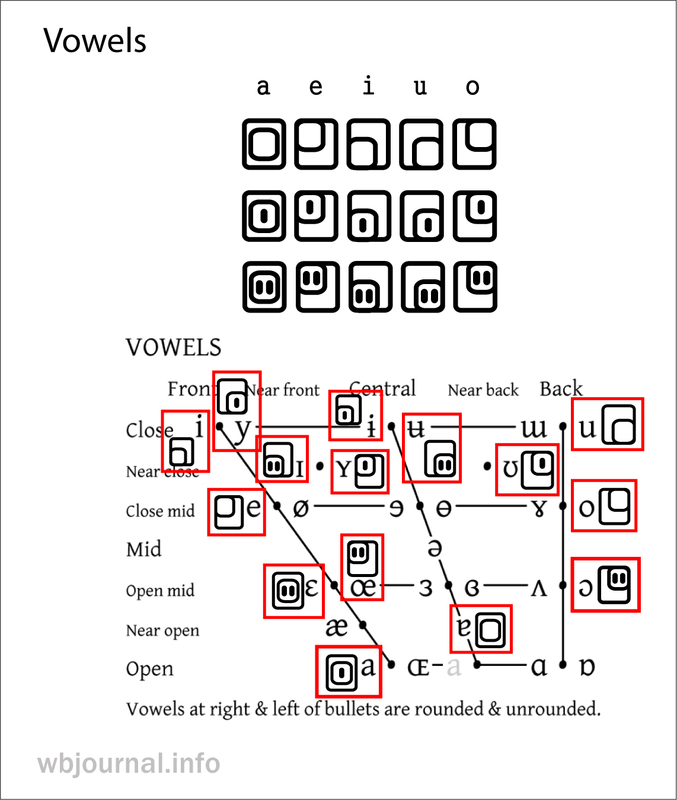 While a Dan has only five vowel glyphs, it has fifteen phonemes. 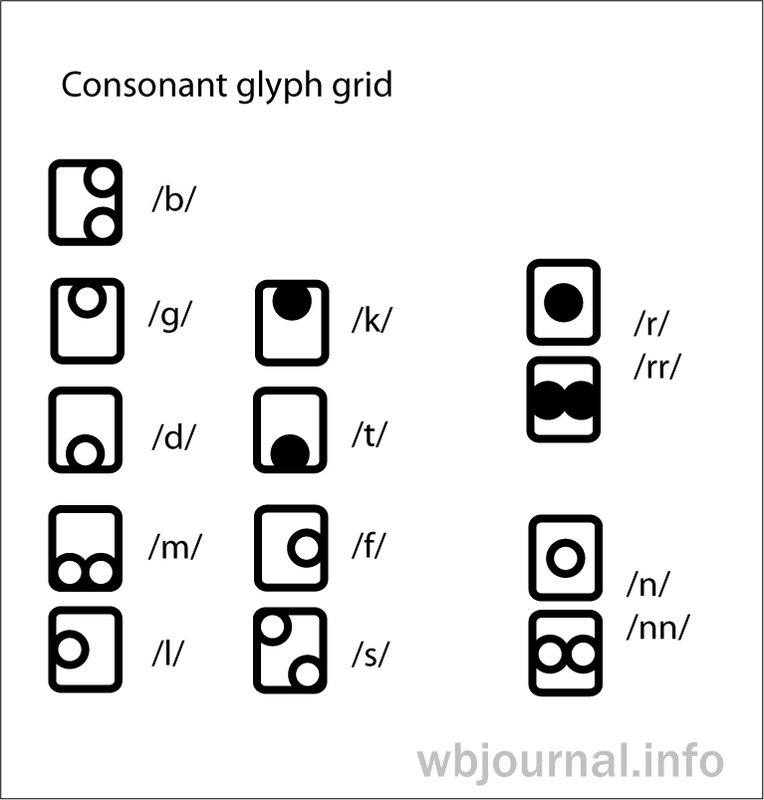 Each glyph has three grades. 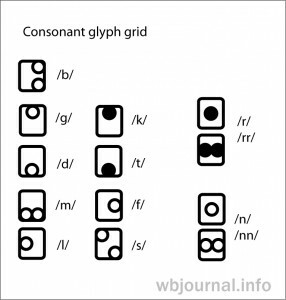 Glyphs of the first grade are called free and have no markings. 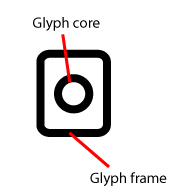 Grade Two (Romanized with the inverted breve) has a single stroke marking in the glyph’s core; grade Three (Romanized with the macron) has two strokes in the core. 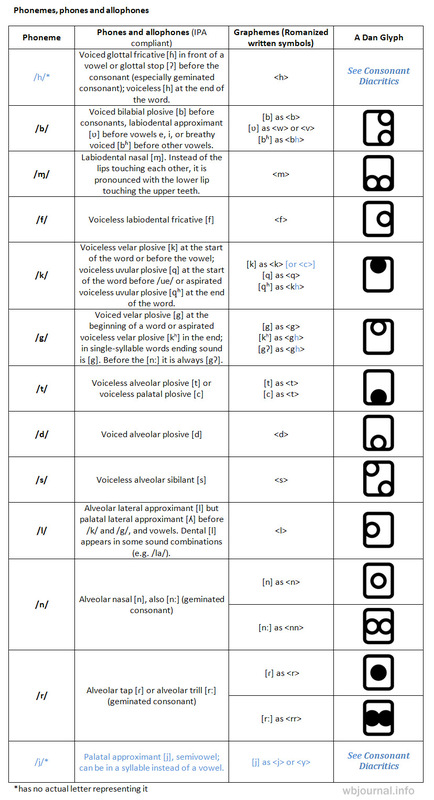 Not all consonant phonemes are represented with glyphs. There are two, /h/ and /j/, which don’t have their own letters. 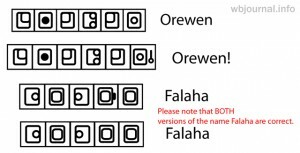 They are shown with diacritical markings instead. 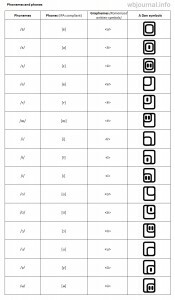 A Dan has 13 consonant phonemes, but only 11 glyphs for those. /j/ might be represented as letter j or y. With vowels it is as y (when word starts with /j/ which is followed by vowel, or /j/ is between two vowels); with consonants it is j (between consonant & vowel, or between two consonants). E.g. Eyuran, Rjg, tjrnenagh. 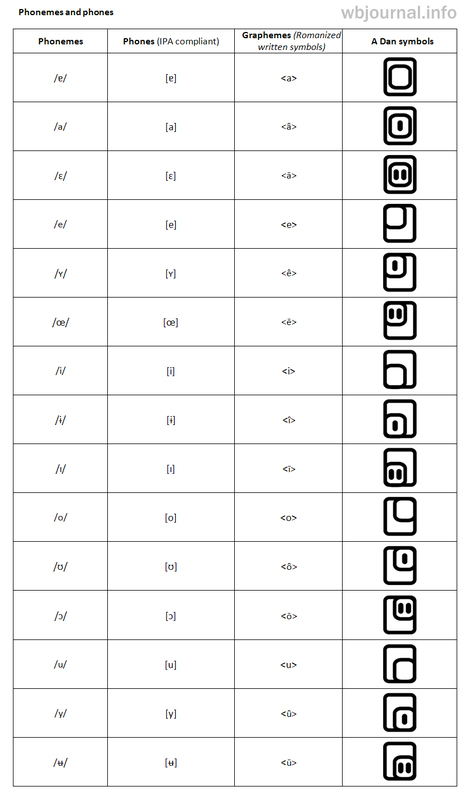 A Dan has fifteen vowel phonemes, and only five glyphs for those. This is where things get complicated. The diacritical marking for /h/ can be omitted between two identical vowels, as they will always have /h/ between them (e.g. Falaha). A Dan does not have geminated vowels. There are no diphthongs, but there are clusters of vowels without syllable break. These are treated as long vowels. In A Dan different phoneme can change a meaning of a word, or be an allophone. Though they only have five letters for vowels, diacritical marks help distinguish between the sounds in similar-written words. Moreover, sounds can have different length and it is not marked in any way; it is simply an accent on different worlds. Foreigners have to learn the pronunciation from the native speakers. Natives can tell where you are from just by hearing you talk. Here the classic A Dan is presented, as it is spoken by the Danna. 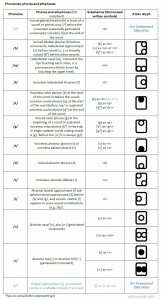 All syllables have at last one vowel or semivowel [j] as a nucleus. Some syllables can contain 2 or 3 vowels, or combinations of one or two vowels with semivowel. 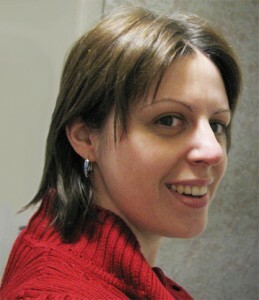 A Dan has no consonant clusters bigger than three phonemes. This is fantastic! Reminds me of my days studying linguistics for University. I love the glyph system you have developed as it makes the writing look so pretty. Developing my own language is something I’ve stayed away from just because it’s SOO hard to do right. Though lots of peo­ple ask me how to do it. However, you seem to have really rel­ished in the development of this language and it looks great! thanks for stopping by. I’m glad you like my glyph system. The hardest part was to design something the other conlangers already didn’t, and that had fit the requirements of my invented culture, both aesthetically and practically. This is the trouble with aposte­riori developed languages — more limitations.